"For this we say unto you by the word of the Lord, that we which are alive and remain unto the coming of the Lord shall not prevent them which are asleep. "Then we which are alive and remain shall be caught up together with them in the clouds, to meet the Lord in the air: and so shall we ever be with the Lord." The word for shout used here means a WAR-CRY! 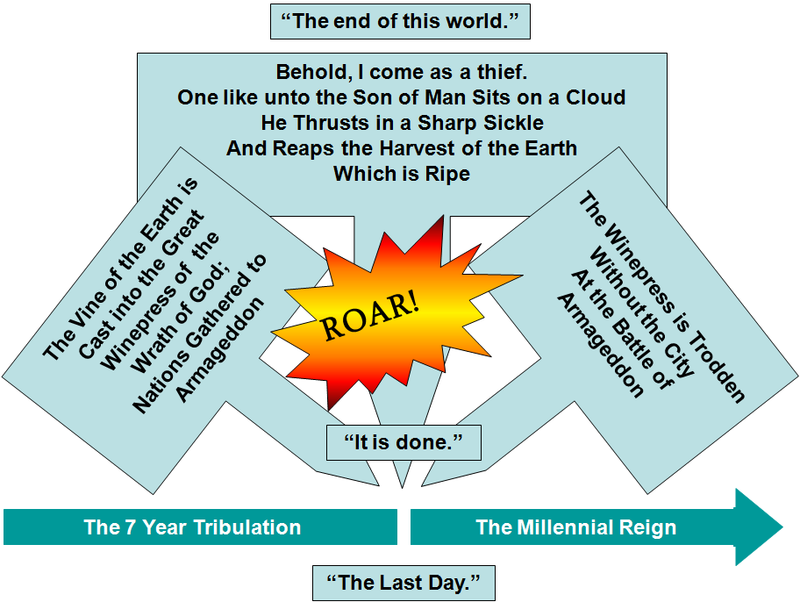 (per Martin Luther) If the pre-tribulation Rapture is correct, then why is the Lord shouting a war-cry SEVEN years before the battle starts? "[The Lord] ascended into heaven after his resurrection,...into the third heaven, which must retain him till the restitution of all things; and then he will come again, and appear in his glory....The appearance will be with pomp and power, with a shout - the shout of a king, and the power and authority of a mighty king and conqueror." Did you see that? Henry did NOT say that Christ would come seven years before the Revelation to gather out the believers; no, he said that Christ would remain in the third heaven UNTIL he returns in glory. And at this time, Christ will SHOUT as a conqueror!! "The sun and the moon shall be darkened, and the stars shall withdraw their shining. The LORD also shall roar out of Zion, and utter his voice from Jerusalem; and the heavens and the earth shall shake: but the LORD will be the hope of his people, and the strength of the children of Israel." Note that the timing is again just after the tribulation of those days (Matt. 24) when the moon is darkened, etc. "Therefore prophesy thou against them all these words, and say unto them, The LORD shall roar from on high, and utter his voice from his holy habitation; he shall mightily roar upon his habitation; he shall give a shout, as they that tread the grapes, against all the inhabitants of the earth. A noise shall come even to the ends of the earth; for the LORD hath a controversy with the nations, he will plead with all flesh; he will give them that are wicked to the sword, saith the LORD." Here again, Jeremiah gives us a clue to the timing of the shout. It is "as they that tread out the grapes." This is a reference to the battle of Armageddon. If the shout of 1 Thessalonians 4 is AT the Revelation, doesn't it make sense that the Rapture of 1 Thessalonians 4 is also AT the Revelation? Those who believe in a pre-tribulation Rapture would have us believe that there are TWO shouts, one before and one after the Tribulation. Which leads us to our next post.